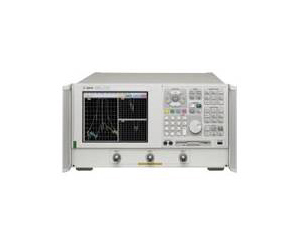 The Agilent N3381A vector network analyzer is a member of the PNA Series network analyzer platform and provides the combination of speed and precision for the demanding needs of the component test requirements of today. The PNA Series meets this testing challenge by providing the right combination of fast sweep speeds, wide dynamic range, low trace noise and flexible connectivity. The N3381A is a three-port network analyzer that offers many optional capabilities to custom fit the analyzer to meet your application requirements. Full three-port error correction ensures outstanding accuracy. Powerful automation and self-help tools make the instrument well suited for both R&D and manufacturing.